Have you heard about ‘your body is pressed down by scissors?’ When I was kid, I heard adults sometimes tell each other they were pressed down by scissors the previous night and talked about horrible ghost stories. I didn’t understand what it was until I experienced it one time. I didn’t know why they’re afraid of being pressed down by ‘scissors.’ People, who are tired, are stressed out, or don’t have strong spirit, sometimes have this experience. Literally, you feel that your body is pressed down by heavy stuff between you as you are about to fall asleep. You’re half sleeping and feel something press down on your body hard. It could be a thing, part of a human’s body, or a human (according to the experiences of people around me, such as family and friends). Those could be regarded as scissors. Some frequently have this experience, others don’t in their lives. Even though I didn’t see something, I have had the same experience since being a teenager, having my body pressed down by something bulky and I couldn’t move my body at all for a while, right before I fell asleep. It wasn’t a pleasant experience. In my case, it happens when I sometimes go to bed after 1 am. I still don’t know what it is. Maybe I was way too tired. But netizens share their experiences. A blogger wants to share his worries about it. 올해 26살 먹은 건장한 남자입니다. (어릴적부터 유도, 검도등 운동을 해서 정말 건장하고 건강합니다). 인터넷에 이런 글 처음 써보네요. 악플보다는 진지한 의견들 부탁드립니다..
이야기는 작년 여름 철수 집에 놀러가서 생긴 일부터입니다. 하루는 술을 잔뜩먹고 철수집에서 하룻밤을 잤습니다. 다음날 저는 철수랑 이야기를 나누다 귀신 이야기가 나왔고 장난으로 ‘니방 귀신 내가 데려가께, 귀신아~ 귀신아~ 나 따라와라~’ 이런 식으로 말을 했었습니다. 난생 처음 가위 눌림을 당했습니다. 놀라서 인터넷에서 가위에 관련된 이런저런 글을 봤었죠. 그리고 얼마후..일요일 낮에 여자친구집에서 잠깐 낮잠을 자는데 가위 눌림을 당했습니다. 그때 똑똑히 봤죠 여자라는 것을….. 제가 가위를 눌리는 동안 여자친구는 저를 깨우고있었답니다..
그러다 어제.. 새벽 3시쯤 제 방 침대에서 엎드려 잠을 청했습니다. 예, 또 가위 눌림을 당했습니다. 근데 평소와는 다르게 너무 무서운게 도망을 가고 싶드라구요. 몸은 움직이지 않았지만 제 머리속은 방에서 나가고 싶어 마루쪽을 향해 기어가는 생각뿐이었습니다. 그 순간 누군가가 저를 방밖으로 끌어 내던지는데 어찌나 힘이 쎈지 공중에 붕떠서 날라갔습니다. 고맙기도 했지만 왠지 내 방에서 쫓겨난 느낌이 들어 마루에 던저진채로 방을 봤는데 방 문이 없는겁니다………. 그리고는 가위에서 풀려났습니다.. 제 몸은 여전히 침대에 엎드려 누운 상태 그대로였습니다….작년 봄까지만해도 가위 눌림을 겪는건 그저 남의 이야기였습니다. 친구집에서 그 일이 있은 후,, 너무 빈번하게 가위 눌림을 당하고 있습니다.. 비슷한 경험 있으신분 없으신가요? 후… 꼭 조언 부탁드립니다. I am a healthy 26 year old man. Since childhood, I did a lot of sports (such as Judo and fencing). It’s first time for me to write on the internet. Rather than bad replies, I beg for sincere opinions. One of my friends who is called Chulsoo (fake name) has been pressed down by scissors and seen ghosts… One summer, I went to see him at his house. Drinking alcohol, I slept at his house. Next day, we talked about ghosts and jokingly I said, ‘I will take your ghosts… ghosts~ ghosts~ follow me~’ and then for the first time in my life, I was pressed down by scissors. I checked about this experience on the internet. Later, I had the same experience. On Sunday, I took a nap at my girl friend’s house and it came to me again. That moment, I clearly saw. It was a woman… While I was pressed down by scissors, my girl friend tried to wake me up because I looked painful according to her…then yesterday.. I was about to fall asleep at my room at 3 am. Yeah… I was pressed down by scissors again. Compared to other times, I was so scared and wanted to run away. Even though I couldn’t move my body, I just wanted to get out of my room and head to the living room. That moment, someone dragged my body out of the room and threw me to the living room. Being thrown on the living room, I looked at the room, but there was no door…. And then I was released by the scissors. My body was still on the bed. Until the spring of the last year, being pressed down by scissors sounded like others’ stories. 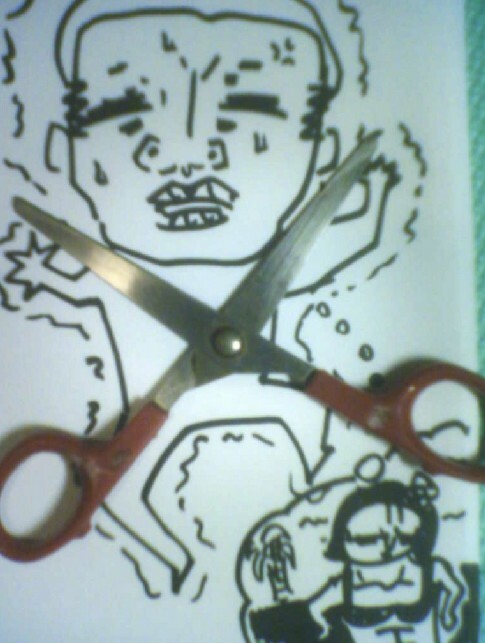 After I talked to my friend at his house, I’m tortured by scissors way too often…. Anyone have a similar experience? Please I need advice. Clayaiken’s story is not so uncommon. 5시, 5시 48분, 7시 이렇게 세번이나 눈을 떴지만, 일어나기 싫어 이불 속에서 부비적 거리고 있었더니 천만년 만에 가위를 눌렀네요. 1년에 한번 겪을까 말까한 일인데 조낸 생생하다능…7시에 불을 켜고 다시 누워있다 정면에 놓인 시계를 보니 8시. 일어나려는데 뭔가 묘한 느낌. ‘헉. 설마 그거?”했더니 역시나.. 흙흙…손목까지만 있는 절단된 손 두개가 양쪽 어깨를 누르고 있었다능.. 그랬다능…손을 올려서 손가락 하나하나를 들었는데 마치 온 몸에 초장을 두르고 입에서 바둥거리는 산낚지 다리 마냥 도로 착 감기더라능…이뭐.. 무슨 자석도 아니고..
Of course, some netizens like yasu shares his knowledge of how people can get away from scary scissors. 가위눌림을 예방하기 위하여는 아래의 규칙을 지키세요. 1. 항상 충분한 수면을 취한다. 3. 규칙적으로 운동을 한다. 하지만 늦은 저녁이나 밤에는 하지 않는다. 4. 취침과 기상 시간을 항상 일정하게 한다. In order to prevent being pressed down by scissors, there are tips below. 1. You should sleep enough all the time. 2. You should lessen stress in your life. 3. You should work out regularly. But you shouldn’t work out late night. 4. Times to wake up and sleep should be regular. Kim02 interprets it based on shamanism and lets netizens know how to get out of the moment. 수면마비라고도 불려지는 가위눌림은 과학적으로는 정신적인 불안 스트레스가 요인이 된다. 무속에서는 사람의 3가지, 공간을 느끼는 장소 (화장실, 잠이 드는 순간, 머리를 감을때) 등이 있는데, 그중 가장 쉬운곳이 잠이 드는 순간이라고 하여서, 잠을 자면서 꿈을 꿈으로 아는 그 순간이라고 한다. 1. Understanding and analysis about being pressed down by scissors. Being pressed down by scissors which is included in sleep paralysis is scientifically regarded as spiritually anxious stress. In Shamanism, there are three things that humans can feel some space (restroom, the moment when you fall asleep, the moment when you wash your hair). The easiest part is the moment when you fall asleep. It is the moment when you recognize dreams as being dreaming. 1)REM 수면기에는 호흡이 불규칙하게 변하며 심장도 빨라지고 숨도 가쁘게 쉬고 혈압도 오르며 이때 목이 조여오며 가슴에 누가 올라탄 느낌이 듭니다. 2)두려움 때문 입니다. 평상시 걱정하거나 두려워하던 일이 악몽으로 나타나고 가위눌림으로 이어집니다. 3)집안에 흐르는 수맥의 영향으로 혹은 갑자기 심한 스트레스로 가위눌림이 옵니다. 4)흔치않은 경우이지만 “빙의”된 경우 그 영가때문에도 발생됩니다. 무속에서 가위눌림은 역시 다른 이공간의 느낌입니다. 따라서 가위를 한번 눌리게 되면 다른 공간의 느낌을 알기때문에, 가위를 눌리다보면, 잠들기전에 이미 오늘 가위를 눌린다는 사실을 알게 됩니다. 이런 이유는 경험에 의한 기억때문입니다. 가위를 눌리게 되면 온몸의 털이 곤두서고 무게를 느낌니다. 무속에서는 정신의 불안정과 함께 살에 의한 작용과 영체의 접근을 막지 못하는 상태에 가위를 눌린다고 봅니다. 2. The reason why you are pressed down by scissors. 1) According to REM sleep, breathing changes irregularly, your heart beating gets faster, and your blood pressure goes up. At that moment, you feel your neck tighten and somebody on your chest. 2) It is from fear. At usual, things you are worried about and afraid of turn to be nightmares and you feel you’re pressed down by scissors. 4) It’s not common, but sometimes a ghost enters your body. The reason why you are pressed down by scissors, according to shamanism. According to shamanism, being pressed down by scissors is to transfer to another space. Once you have been pressed down by scissors, you know the feeling of another space. Therefore, before falling asleep, you get to know you would be pressed down by scissors. It’s because of memory from your experience. You will feel goose bumps and feel heavy. Due to spiritual instability and prevention of ghosts, they believe that people are pressed down by scissors. 3. How to prevent from it? 1) The best way is to relax before falling asleep. Reading scary books and watching horror movies, you will be more easily pressed down by scissors. Before falling asleep, you’d better read peaceful books and listen to comfortable music…. 몸의 어느 한부분, 이를테면 손가락에 정신을 집중해서 움직이려고 노력하는 것입니다. 그렇게 할 경우 대개 손가락정도는 움직일수 있고 차츰 몸전체를 움직이게되며 가위눌림에서 빠져나올수 있습니다…. 4. How can you get out of being pressed down by scissors? You should focus on one part of your body, such as a finger, and try to move it. When your finger could be moved, try your whole body. Then you will get out of it….